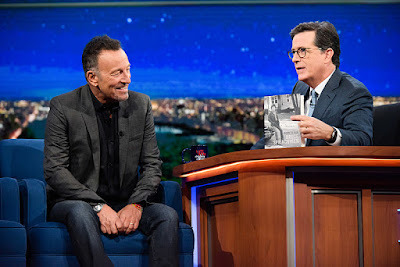 Bruce Springsteen discussed his memoir, “Born To Run”, at length during an extended interview on CBS-TV’s The Late Show with Stephen Colbert on September 23, and video of the full session is available. Springsteen revealed his two earliest music influences were seeing Elvis Presley and The Beatles on the Ed Sullivan Show, originally broadcast from the same studios as Colbert’s current program. The New Jersey rocker shared stories about his relationship with his father and his Catholic upbringing, how both impacted his songwriting, and how his lengthy, 4-hour concerts helped him find some peace. "I was this incredibly neurotic young kid [with] a lot of anxiety, which I didn't know how to chase away," Springsteen told Colbert. "So all I found out was after I played, I calmed down. I felt very centered. It may explain why it goes on so long. It was an easy drug to take." "The band doesn't complain until around three hours and 40 minutes," he added about the experience. "It's that last 20 minutes that for some reason even makes the E Street Band [angry]… slightly, someone may mention it to me. Why they go that long? I'm not exactly sure. I've been doing it for a long time." Springsteen also named his top five favorite songs from his extensive catalogue. Due September 27 via Simon & Schuster, “Born To Run” sees Springsteen share his life story for the first time alongside the newly-issued “Chapter And Verse”, a collection of unreleased and classic tracks that doubles as an audio companion to the memoir. The singer will support both projects with a 9-city book tour starting in Freehold, NJ on September 27.